The Okuma MULTUS B550 is the embodiment of efficiency and process flexibility with a multifunction turning center including left and right spindles, milling spindle, an automatic tool changer and a variety of machining functions. Complete the work in one set-up and with tools to spare in the ATC. The MULTUS B550 has a 240° B-axis range with 5,000 rpm H1-milling spindle with dual function (L/M). The standard H-1 dual function spindle head utilizes CAPTO C8 tooling and has a 50/30hp VAC milling motor spindle [opt. 10,000rpm]. The base offering has 40-tools available via the ATC [optional 80 & 160 tools]. 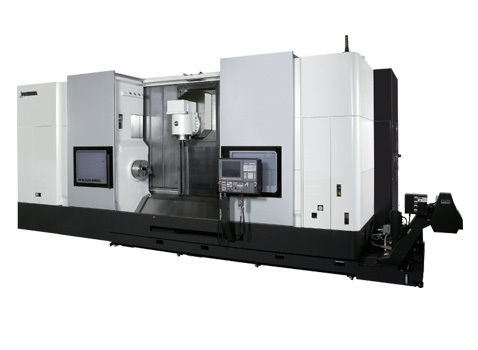 The H1-turret has a 0.001 degree B-axis and traveling column Y-axis for machining flexibility. The Okuma THINC®-OSP control blends familiar programming methods from both lathe and machining center disciplines, giving advanced functions such as total “Collision Avoidance System” as standard. The advantages of the Okuma absolute encoders handle the control of X and Z, the C1, C2, B, Y and W axes without the need for re-zeroing.